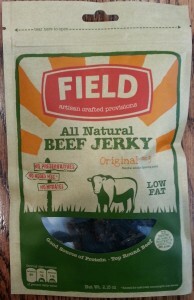 Today’s tasty tester is a bag of Field Trip Original No.3 Beef Jerky purchased as part of a mixed 6 pack special from Woot!. Yes, that’s right. Woot jerky. Taste (A-): This taste of this original style jerky is about being two things: sweet and peppery. The first flavor that hits you is the sweet blend of the brown sugar and pineapple juice that combine elegantly into a rich, almost complexly taste. There’s some soy and vinegar in there as well adding some welcome tangy kick. Further buttressed by garlic and onion it all starts on your tongue as a sweet and savory festival… and then the pepper kicks in. This jerky has a solid pepper punch that settles into your mouth and takes you for a ride. It’s great stuff, and while this level of pepper intensity might ordinarily elicit a ‘peppered’ jerky label, it’s so well-balanced against the sweet and savory flavors that it never dominates the taste. Really, this is a fantastically well-done mix of flavors. Texture (B): This thin-sliced jerky is cut along the grain and is dry, but still pliable. Though tough at first, the pieces chew surprisingly quickly and are generally easy to eat once you work on them a bit. It feels good. Smell (B+): There’s a lot going on with this jerky, smell-wise, and that complexity is probably the only thing detracting from its aroma. One whiff and get a full-on hit of the brown sugar and smoke backed by a menagerie of teriyaki sauce scents and good ol’ pepper. Some of them blend together, some of them stand out, but they all grab a hold of your nose with authority. It smells pretty great, all told, but definitely demands extra attention to sort it all out. Appearance (A): This is a good-looking jerky! The thin sliced pieces sport a rich brown color with a slight red tint. The combination of straight-cut and natural edges is appetizing to the eye and it all conveys the look of a quality jerky made with care and attention. Consistency (A): Thin-cut jerky is a flavor technique that allows the jerky artisan to thoroughly infuse the meat with the flavors of their choosing. Here the comparatively complex flavors are expertly instilled into each bite and are delivered with exceptional repetition. From beginning to end the entire bag was a great adventure in sweet-savory-peppery-goodness from one lean piece of quality beef to the next. 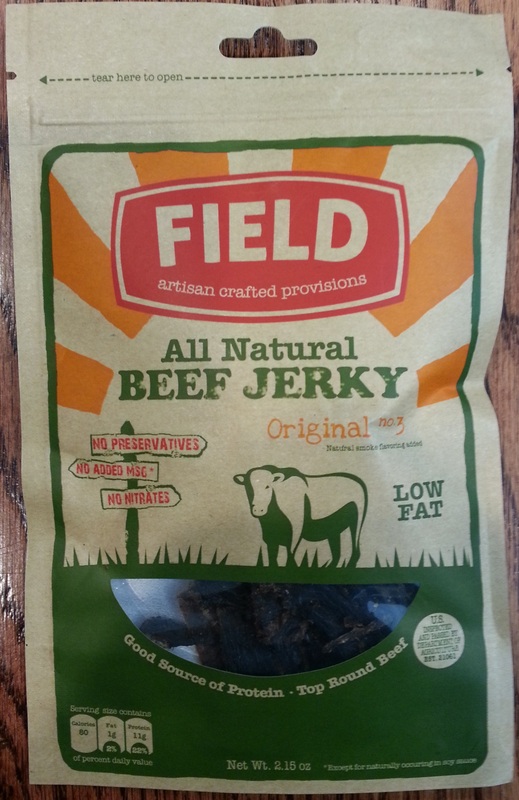 Overall Impression (A-): The folks at Field Trip Jerky have lived up to the artisan label with this delicious, and well-made jerky. It sports a fantastic flavor and is made with the sort of attention to quality that tells you that they take their jerky very seriously. This stuff is really good and if you like jerky that’ll kick-start your tongue with goodness then this is your meat. Pick up a bag and enjoy this delicious, quality jerky. Enjoy! Tagged artisan, beef, field trip, original, pepper, spicy, sweet, thin. Bookmark the permalink.